Even in today's stagnant economy, medical assistants are seeing double-digit job growth. The number of qualified graduates are still limited, which means that physicians are demanding help and whoever can prove their education can get the jobs. If you are looking for stable employment and promotional opportunities within a rapidly growing industry, medical assisting may be your answer. Continue reading to discover the day-to-day worklife of medical assistants and how online medical assisting programs can prepare you for this new career. Medical assistants form the administrative and clinical support backbone of a number of physician practices and healthcare institutions. They go by a variety of names including medical office assistant, medical laboratory assistant, clinical assistant, medical secretary, medical receptionist, or phlebotomist. While no job is typical, medical assistant personnel generally help with patient filing and billing, receptionist duties, health histories, laboratory testing, and general office upkeep. Medical assistants cannot practice medicine without a license, but they can help with virtually any task that does not need to be performed by a doctor or nurse. They free up the physician's time for patient visits by taking over some of the day-to-day duties. Medical assistants most often work during the day, but some employers may require evening or weekend hours. Other duties depend on the size of the office, its specialization, and the other healthcare workers employed at that location. Administrative medical assistants focus on the non-clinical, or clerical, aspects of seeing patients. They are typically in charge of maintaining accurate and up-to-date medical records and contact information, filing patient records, completing insurance forms and acting as a liaison with any billing service, and scheduling hospital admittances, laboratory testing, and other services conducted outside of the practice. Many administrative medical assistants also take on receptionist duties by answering telephones, scheduling appointments, and greeting patients. In small clinics and local doctors' offices, medical office assistants may hold the title of office manager and oversee most non-medical operations. While administrative medical assistants handle day-to-day operational duties, clinical medical assistants directly assist physicians and take over some of their duties. Their roles are limited by state laws and doctor preferences, but common tasks include preparing patients for examination and x-rays; recording blood pressure, temperature, and other vital signs; clarifying medical histories; assisting physicians during examinations; and explaining physician instructions, treatment plans, dietary restrictions, and medication dosage to patients. Many assistants also change dressings, remove sutures, and administer medications. Clinical medical assistants may also have laboratory-related duties such as collecting specimens, drawing blood, performing basic tests, sterilizing medical instruments, and disposing of contaminated supplies. While the majority of medical assistants work in family practice or general patient settings, approximately 11% work in specialized practices. These individuals choose to specialize in a field that interests them and/or provides better opportunities for employment in the area. Three popular specialization areas are ophthalmology, optometry, and podiatry. Ophthalmic medical assistants measure vision, perform diagnostic tests related to eyesight issues, apply eye dressings, help patients to use and care for contact lenses, and administer eye medications. 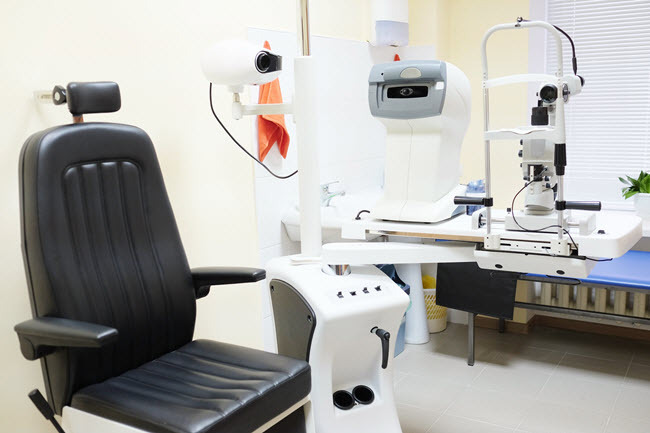 If the ophthalmologist performs surgical procedures, the medical office assistant may also maintain surgical equipment and help during surgery. Optometric medical assistants have duties that are similar to ophthalmic assistants, but they work with an optometrist. They conduct tests, assist during diagnosis and treatment, and work with patients on the proper usage, care, and maintenance of contact lenses, glasses, and corrective devices. In addition to general office duties, podiatric medical assistants work with x-ray equipment, make castings of feet, and help podiatrists during surgery. Some people confuse the roles of a medical assistant with those of a physician assistant. These two positions are not the same. The medical assistant works as a support professional to ensure the smooth operation of the medical office and its routine tasks. The physician assistant, abbreviated as PA or PA-C, diagnoses and treats patients under the supervision of a physician. Consequently being hired as a PA requires significantly more education and clinical experience. Qualified medical assistants will be in an enviable position through at least 2018. While other Americans are looking at jobs with growth potential around 11%, the medical assisting profession is expected to see demand in excess of 34%, according to the U.S. Bureau of Labor Statistics. Since new positions are being created at a rapid pace, well-trained medical assistants may have their pick of employment locations, working conditions, and compensation. This explosive job growth is due to a number of factors. First, the general aging of the U.S. population has led to a greater need for healthcare workers specializing in geriatrics and related conditions. Second, the rise in obesity and diabetes has filled doctors' offices and clinics with patients looking for relief. Finally, the movement of patient care from large hospitals to smaller clinics, group practices, and other medical facilities has boosted the demand for clinical and administrative medical assistants in virtually every city and state. Medical assistants work for a variety of medical professionals. Major employers include hospitals, physician offices, outpatient care centers, nursing homes, colleges and universities, dialysis centers, laboratories, insurance companies, and public health clinics. Over 62% of medical office assistants work full-time or part-time for one or more physicians. The majority of medical assisting professionals work in the states of California, Texas, Florida, Pennsylvania, and Ohio. As with virtually any profession, the salary for medical assistants varies by location, employer, skill level, and experience. As of May 2010, the United States had employed 523,000 medical assistants at an average yearly salary of $30,000. The most highly paid medical assistants can earn $40,000 or more. Top employers tend to be psychiatric and substance abuse hospitals, dental offices, research facilities, and insurance companies. Another way to increase salary is to advance within the profession. An entry-level medical assisting position can lead to greater levels of responsibility and professional development. Some clerical assistants choose to become office managers, administrative support personnel, or clinical assistants, while clinical medical assistants may move on to medical assistant supervisor, nursing, teaching, or other healthcare-related positions. Education and on-the-job training are both essential qualifications for anyone wanting to advance in the field. What Education and Training Is Necessary for Medical Assisting? A high school diploma is the minimum qualification for becoming a medical office assistant. Even though some medical assistants can be hired after taking only fundamental high school courses, the best jobs are reserved for assistants with more advanced education. As the field becomes more competitive, skilled medical assistants with adequate training will have an advantage over other newcomers. Certification is not required to become a medical assistant but can improve an applicant's hireability, promotional opportunities, and earning potential. Employers have a greater level of confidence in medical assistants who can prove they meet industry standards. Professional associations such as the American Association of Medical Assistants (AAMA) or the Association of Medical Technologists (AMT) develop these standards and then test certificate applicants on their ability to understand and perform certain duties. Medical assistants can also use the certifying process to gain greater knowledge of a particular specialization, such as optometry, ophthalmology, or podiatry. Anyone interested in certification should pursue a program accredited by a recognized professional organization. Accreditation is the process through which a medical assisting program proves it delivers the high levels of quality, academic standards, and healthcare-focused skillsets expected from its students. For example, a program accredited by the AAMA focuses on academic and clinical training in human anatomy and pathology, pharmacology, diagnostic procedures, laboratory techniques, first aid, patient relations, recordkeeping, and insurance processing. These programs also typically have a practicum aspect, which provides hands-on experience and on-the-job training in a healthcare setting. Only students who complete an AAMA-accredited program or its equivalent are eligible to apply for the Certified Medical Assistant (CMA) credential. In a similar manner, the Registered Medical Assistant (RMA) certificate issued through AMT can be obtained only by completing a select list of courses and then passing a knowledge assessment exam. These medical assisting programs must be accredited by the Accrediting Bureau of Health Education Schools (ABHES), the Commission on Accreditation of Allied Health Education Programs (CAAHEP), a regional accrediting body of the Higher Learning Commission, or a national accrediting organization recognized by the U.S. Department of Education. Associate's degree: two-year degree focused on both medical assisting and general education requirements. Certain courses may be transferred into four-year bachelor's degrees, while other medical assisting associate's degrees are designed as terminal degrees. Diploma: medical assisting curriculum lasting between eight months and one year. Medical assistant diplomas focus solely on the industry and the skills necessary to get a job; they do not include traditional general education courses such as english or history. Few courses from a diploma can be transferred to associate's or bachelor's degrees. Certificate: diploma coursework combined with preparatory material to pass a certifying exam. Some medical assisting schools use the terms certificate and diploma interchangeably. No matter which medical office assisting program you choose, you will be taught how to think critically, write and speak effectively, understand human behavior, and communicate professionally. After you graduate, you will be able to perform clinical assisting, laboratory procedures, and clerical duties. To be admitted to these programs, most students need only a high school diploma or GED. They do not typically require college entrance exams. At the same time, students whose native language is not English may be asked to complete a proficiency exam, such as the TOEFL or IELTS. Work experience is not often a requirement, since most students interested in medical assisting have not worked in the field before. Time to Completion - How Long Until Graduation? Medical assistants can earn a certificate or diploma in as little as one year. Longer programs are offered for students interested in an associate’s degree. Few schools offer a bachelor's degree dedicated to medical assisting. Medical assistants must be familiar with the terminology and processes associated with working in a healthcare office. Most degree, certificate, and diploma programs cover the topics of anatomy, physiology, biology, record-keeping, insurance processing, accounting, transcription, and data entry/keyboarding. Other courses include medical law, medical ethics, patient relations, office practices, pharmaceuticals, first aid, laboratory techniques, and diagnostic procedures. Administrative medical assistants may receive supplemental courses in ICD-9/CPT coding, HIPPA-mandated coding, collections procedures and laws, how to use various scheduling and office management systems, and OSH compliance. Clinical medical assistants may take additional courses in blood borne pathogen precautions, sanitization and sterilization procedures, instrument use and disposal, charting procedures, testing procedures, drug interactions and dispensing requirements, post-surgical care, ECG monitoring, and emergency response. As mentioned previously, associate degrees also include courses in composition, math, social science, and humanities. Some traits that distinguish excellent medical office assistants cannot be taught in the on-campus or online classroom. These characteristics include a willingness to work with a diverse group of co-workers, supervisors, patients, and vendors; neatness and dependability; a polite and understandable way of communicating complex information; and an appreciation of confidentiality. Medical assistants must be organized, follow instructions well, and be able to work on several tasks at the same time. Patience, empathy, and compassion are also essential traits of top performers. Online medical assisting degrees are often fantastic programs for working adults because they are more flexible than traditional campus-based education. Furthermore, online diplomas look like every other diploma, so no one will know that a student learned about medical coding and billing and clinical operations from the comfort of a recliner at home. Courses and support services vary from school to school, but most online schools offer 24-hour course access, audio and visual presentations to supplement textbook readings, chatrooms and forums to encourage student interactions and problem-solving, and an online help desk to troubleshoot any technical issues. Tests are either given online or proctored through a local community college, university, or authorized testing facility. Distance learning is not for everyone, however. The best online students are able to learn through readings and written interaction, are motivated to complete assignments by their due dates, can dedicate a certain amount of time to school each week, can afford the financial commitment, and are focused on applying their knowledge to a suitable career path. Locate an accredited medical assisting program that meets learning needs, goals, and budgetary constraints. Financial aid may be available to support eligible students at some institutions. Complete the program and qualify for certification. Most students who earn a medical assisting diploma or degree from an accredited institution are able to take the certifying exam right away. The exam requirements depend on which professional association has issued the accreditation and whether any waiting periods or experience minimums have been fulfilled. Register for and pass the certifying exam. These exams gauge a student's knowledge of the medical assisting profession, administrative processes, and clinical procedures. Exams are offered regularly but typically must be scheduled in advance. Most certification exams today are completed in a testing center via a computer application or the Internet. Test results can take several weeks for processing. Celebrate! Passing a certification exam means being ranked as one of the top medical assistants in the nation. This credential can open doors to lucrative job opportunities that never would have existed for people entering the field out of high school. Apply for medical assistant positions. Thousands of jobs are advertised each day through career centers, job boards, employee referrals, newspapers, journals, and other sources. Impress the interviewers and get the job! Becoming a medical assistant takes some hard work, but the effort is worth the reward. By showing a dedication to the profession and a drive to succeed, medical assistants can give employers the confidence they need to make the right picks for the job. Whether you choose a career in administrative assisting, clinical assisting, or medical assisting in a specialized practice, the right education can unlock one of these in-demand positions for you. Online medical assisting programs teach you the skills and healthcare knowledge you need to be successful as a medical office assistant.